Preggatinis: Mixology for the Mom-To-Be | Welcome to the Preggatini Party! Southern California McDonald’s® restaurants are bringing back Shamrock Shakes in celebration of St. Patrick’s Day for the next month! 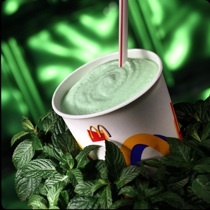 The minty green milkshakes were first launched in 1970 and have been a recurring promotion ever since. If you’re in the mood to feel like a kid again this would be a good excuse to pat the Hamburgler on the head, give Ronald a hug and sail through the golden arches. I’m already a big fan of all things Kiwi (“kiwi” as in “hailing from New Zealand”). It has one of the lowest population densities on the planet, nature reigns supreme and is regarded as one of the purist places in the world. So, when Waiwera Water crossed my path, I was excited to try it. The word “waiwera” comes from the indigenous Maori word ‘Te Rata’ or ‘The Doctor.’Legend has it that New Zealand’s Maori warriors would go to Waiwera to bathe in the waters to recover from the rigors of battle. Scottish-born Robert Graham found Waiwera in 1875, decided to sell this “elixir of health” and the family-owned business still thrives. According to the company, Waiwera water is carbon dated between 7.6 and 15.3 thousand years old, and pumped directly from one of the largest aquifers in the world. The bore is sunk 400m (1/4 mile) to protect against surface contamination and goes through an advanced filtration process before it is bottled, capped, and shipped out. 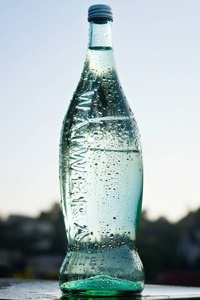 Waiwera was voted the world’s best water in 2008 by Decanter Magazine and its bottle won several prestigious design awards including “Best Bottle in Glass” at the Bottledwaterworld Design Awards in Milan and the Gold Medal for “People’s Choice for Package Design” at the Berkeley Springs International Water Tasting Awards. What I like about both the still and sparkling versions is that Waiwera is not too salty and has low minerality, so it tastes “clean,” and its alkaline (ph 8.5) is believed to help counter the naturally acidic conditions of the modern human body. Waiwera is available at upscale hotels, restaurants and gourmet stores in California and Hawaii. Plus, after hydrating our bodies with refreshing, pure Kiwi water, reusing the decorative glass bottle is a way to keep our whole planet pure. World’s Biggest Online Baby Shower! Designer of “The Original” Upscale Shower Games from BadaBadaBingo Fun Games Co! Stay for 8 minutes or 8 hours. Just take a look at the gifts!!! All are invited to come! Men, too! We’ll see you on Wednesday for the hippest baby shower filled with love, advice, fun, games, prizes and gifts galore!! Pssst, Invite as many friends as you can! The person with the most friends that show up in their honor will win a snazzy stroller! Are you wondering what would make your Preggie Party Girl dance a little jig of delight this holiday season? Perhaps a copy of Preggatinis(TM): Mixology for the Mom-to-Be! As a special thank you for the support you all have offered during the year since the book has been released, I’m also offering a FREE Preggatinis muddler on all orders placed between now and Dec. 31, 2009. You can ORDER this Preggatinis gift set here and don’t forget to include your personalized inscription when placing the order. Happy holidays – and Cheers! As a woman blooms into pregnancy, everyone around notices her how beautiful she is becoming… glowing, radiant and happy. Her hormones are in full drive and she has probably never “sparkled” more than during these nine months. However, those same hormones can affect her complexion (pregnancy acne, anyone?) not to mention a belly-full-of-baby can leave a few souvenirs in the form of stretch marks, once it shrinks back down to its normal size. Please come by and say hello. I look forward to meeting you. For more info on The Liquid Muse, please visit my main website. Sign up for the Preggatinis Newsletter and get new recipes each month! Stefani’s first born son, Kingston, has an 8 1/2 pound little bro named Zuma Nesta Rock – and man, the internet is a-blaze with speculation as to why the baby was named that. Well, it seems pretty obvious to me, a fellow So-Cal girl, that the gorgeous stretch of Malibu shore called Zuma Beach could easily serve as inspiration. Duh! Toast little Zuma with a drink created in honor of his big brother. The Kingston Krush is featured in the CelebriBaby Preggatini chapter in my book!